When it comes to SUV credentials, the Subaru Forrester is among the top of the segment. After all, its last 2 generations were highly praised and numerous experts regarded it as the SUV of the Year when they came out. This is a ride that you can depend on, which is a crucial feature when it comes to a family ride. Basically, it’s been known to transport families safely and comfortably regardless of the conditions, the destination, or the amount of gear they have. When you have your family on long rides inside a car, you want them comfortable to minimize the complaints and the squabbling. The suspension has been revised and it’s now even more terrific, and the chassis is great as well. You can expect a fantastic ride quality for your family. Part of the improvement is because the Forester has been moved to the Subaru Global Platform. This is the platform underneath the Crosstrek, Impreza, and the all-new Ascent with its 3 rows of seats. In the Forrester, the designers liberally used structural adhesive while the body of the vehicle is now more rigid. All these improvements have made the ride very smooth and comfortable, with minimal body roll and without excessive vibrations. It even offers a comparatively quiet ride. 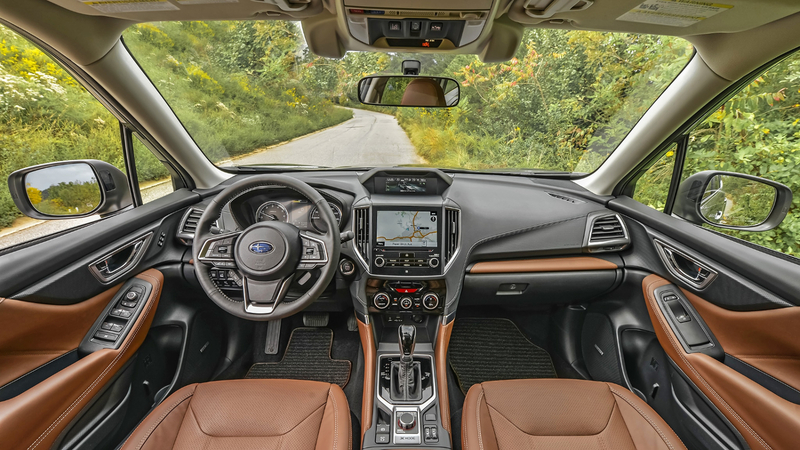 Steering the car doesn’t take much of an effort, and it’s great that Subaru managed to achieve this without giving you a numb driving experience. You still feel that you’re driving the car, and not that the car is driving itself. The steering has been redesigned so that there’s not much of a delay between steering input and response. You’re better able to take corners with this SUV, due to the added torque vectoring. You can also use the brakes much more confidently as the brakes are controlled and smooth. It doesn’t take much of a pedal stroke before braking. 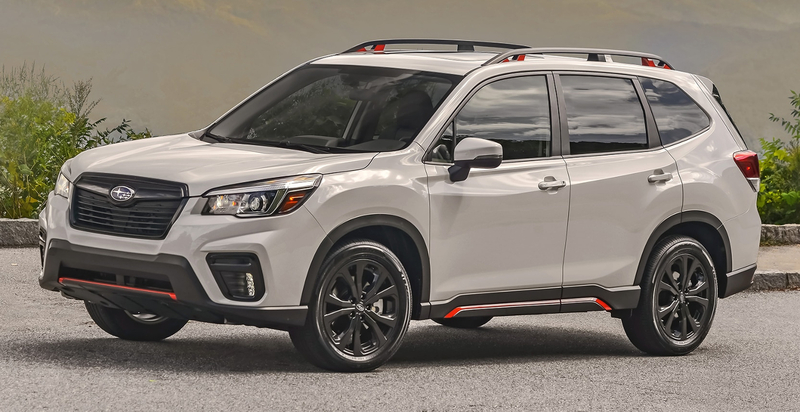 This is perhaps the weakest point of the 2019 Subaru Forrester. This model now comes with a redesigned 2.5-liter horizontally opposed 4-cyclinder engine. With the 182 HP and 176 lb-ft of torque it generates, it’s somewhat underpowered. This is now direct injection. Subaru also redesigned the continuously variable transmission with a quieter and lighter torque converter. The CVT on the Sport and Touring trims have a 7-speed manual mode with paddle shifters, and even if you’re not a fan of shifting at least it’s not distracting. Because the engine is underpowered, it takes a rather long time to get the SUV to highway velocity. Getting to 60 mph feels like watching paint dry. If you’re thinking about overtaking on the highway, you better make sure you’ve got plenty of clear road space ahead. If you’re traveling on inclined roads, the engine gets too loud and it sounds like it’s straining itself to get to the right speed. Subaru, however, did this because they paid attention to their customer profile. They did have a 250 HP 2-liter turbo-4 available before. But only 5% of Forrester customers picked that option, so it was clear to them that these customers didn’t care much for power. Subaru also did away with the 6-speed standard manual transmission. If Forrester customers didn’t care for power, what did they care about? Subaru already took care of the ride comfort. Now they also addressed the other important aspect, which is fuel efficiency. To improve fuel efficiency, the 2019 Forrester now has the automatic Start/Stop. This is a huge deal, because the only other SUV in the US with a similar system for fuel savings is the Crosstrek hybrid. This system gives you 33 mpg on the highway and that’s with AWD. It equates to 548 straight miles of driving before you need to fill the tank up again. As this is a family car, the 2019 Forrester doesn’t really allow for quick agile starts when you have the Start/ Stop feature activated. There’s a noticeable pause between putting your put on the pedal and the restart. But this feature won’t automatically turn off your engine when the SUV computer thinks that you will need instant power for the situation you’re currently in. It won’t switch off the engine when you’re driving in high altitudes, when the light has turned green, or when you’ve turned on the turn signal. Nothing really changed, and Subaru feels like that’s what the customers wanted. The Forrester already has its own distinct styling, and it retains its basic look. Sure, there have been some updates of course. There have been some new sculpting features on the side. The rear seats offer more leg room with more space for storage. The cooling and heating vents are now even more efficient and more silent. All in all, the 2019 Forrester retains what made the model so beloved and respected in the first place. It made improvements, but it’s still the Forrester you can rely on. The model prices range from $25,270 for the base model and up to $35,270 for the Touring trim.